Eco:Map can import any number of attributes distinguishing however between search and additional attributes. Search attributes contain information that are to appear in the search view. If your files contain more than one column you are asked to specify which of your columns corresponds to which search attribute. Scientific Name is the only mandatory attribute. Common name No Any text. If you want to have several common names please separate them by commas. Accepted name No Assigning an import file column to this search attribute means that every species that has a value of 1 or Y is regarded as accepted. If there is no such column every species will be treated as accepted. You need CSV import files. Importing is done via iTunes® Version 9.1 or higher. Additional attributes do not appear in the search view but in an own section Additional information at the end of the individual find dialogue unless you have determined another position in your own templates. Additional attributes are invariable with only one exception: All attributes contained in a template occur as normal attributes at the expected position in your individual find dialogue. Eco:Map regards all columns in your import file that is no search attributes as additional attributes. Open iTunes and drag your import file into Eco:Map's Documents folder. 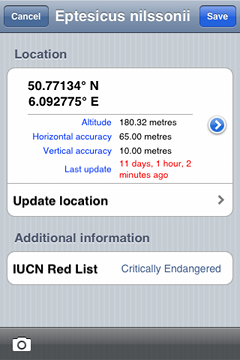 Launch Eco:Map, tap on Databases and touch +. From the list of import files choose My species. You get to the overview of search attributes (see right). Now assign the columns of your import file to the search attributes, e.g. scientific_name → Scientific name and english_names → Common name and so forth. Importing begins automatically. After that you go back to Databases. 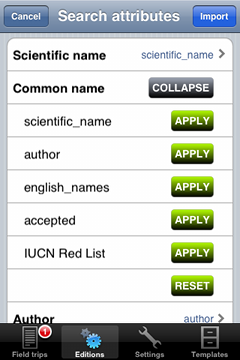 In the section User defined databases you see your new database My species that you can select as the current one.